Explore now Hanoi and Saigon, two of best golf destinations in Vietnam and two of Vietnam golf vacations most requested packages. 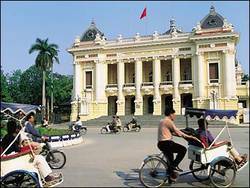 Explore the capital of Vietnam in the northern end and explore the economic destination which host one of the best golf courses in the south. The Best of Vietnam golf package is a 7 day golf tour featuring four of the best golf courses in Vietnam and is designed for the golf enthusiast who demands the very best from their golf tours.